Just when you think you're doing good with your neatly labeled recycling bins, along comes some Buddhist monks to blow you out of the water. More than 30 years ago, the monks of Wat Pa Maha Chedi Kaew, in the Khun Han district of Thailand, decided to turn all of the discarded beer bottles that were littering the outside of their complex into a gorgeous temple now known as Wat Lan Kuad, or Temple of a Million Bottles. It actually took more than a million bottles to complete, and some walls feature intricate mosaics made from the bottle caps. 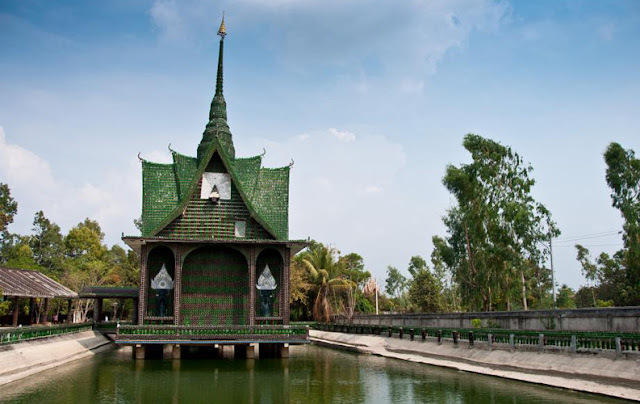 Then, drunk on the sight of their amazing feat (if not the beer fumes), the monks took it to the next level and started constructing more buildings in the complex out of bottles, including the bathrooms and crematorium. I know. I can't think of a better way to leave this world either. So let this be a lesson to you: Never compete with a monk, even when it comes to alcohol.